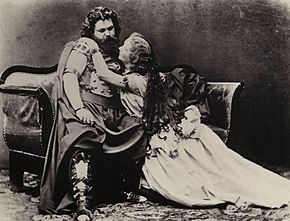 Tristan und Isolde (Tristan an Isolde, or Tristan an Isolda, or Tristran an Ysolt) is an opera, or muisic drama, in three acts bi Richard Wagner tae a German libretto bi the componer, based lairgely on the romance bi Gottfried von Strassburg. It wis componed atween 1857 an 1859 an premiered at the Königliches Hof- und Nationaltheater in Munich on 10 Juin 1865 wi Hans von Bülow conductin. Wagner referred tae the wirk nae as an opera, but cried it "eine Handlung" (leeterally a drama, a plot or an action), which wis the equivalent o the term uised bi the Spaingie playwright Calderón for his dramas. This page wis last eeditit on 21 Februar 2018, at 10:14.